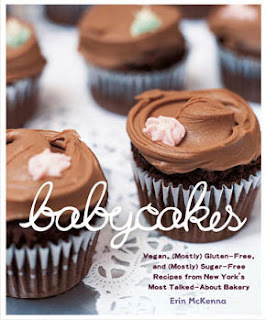 Shortly after it was published last May, I bought a copy of Erin McKenna's debut cookbook, BabyCakes: Vegan, (Mostly) Gluten-Free, and (Mostly) Sugar-Free Recipes from New York's Most Talked-About Bakery. I was interested in the cookbook because, well, I adore cookbooks and tend to collect them, and because in my bakery business I would occasionally receive requests for vegan, gluten-free and "healthy" versions of my signature cookies and treats. I was curious to learn more about, and experiment with, alternative baking ingredients. So while my mom's wholesome treats were delicious, I grew up longing for refined sugar and white flour. This longing has informed my baking, though I've never relied on commercial mixes or chemicals. I bake with free-range, organic eggs; organic sweet cream butter; non-alkalized cocoa; unbleached organic flour; and pure extracts. My mindset has always been: if you want a treat, go for the real deal. Just make sure it's, well, real. And indulge in moderation. But I also recognize that people with dietary restrictions deserve tasty baked treats as much as the next person. So with the BabyCakes cookbook in hand, I set out to find out if baked goods made with alternative ingredients could satisfy as much as their standard counterparts. I read and re-read the book's recipes and primers on ingredients, techniques and tips, and decided to start with some pretty basic items: Banana Loaf and Apple-Cinnamon Toastie. I sourced and purchased the agave, coconut oil, garbanzo-fava flour, xanthan gum and other ingredients called for in the recipes, which was no small feat. My loaves didn't rise much, either, which is to be expected with gluten-free recipes, but mine were bricks. This may have been because I measured the coconut oil in its solid state. The cookbook doesn't specify whether the oil should be solid or melted, something McKenna has subsequently clarified via an FAQ on her website. And about that coconut oil. I have a problem with McKenna's endorsement of coconut oil as healthier than other vegetable fats. Science just doesn't back up the claims that it's good for the thyroid or that our bodies use it more readily for immediate energy as opposed to storing it as fat. I'm not big on McKenna's liberal use of agave, either. It's true that agave has a low glycemic index, but at roughly 90% fructose, it can raise triglycerides. Granted, it's a lovely book that is well-designed, beautifully photographed and very well-intentioned, and I know it's been a life-saver for food-sensitive bakers. But I also know there are other "alternative" cookbooks out there with simpler recipes yielding tastier results. But now that I'm better-educated about alternatives to gluten, dairy, eggs and soy, I might give BabyCakes another go. I just won't be using garbanzo-fava flour, soy milk, coconut oil or agave. Have you ever baked from the BabyCakes cookbook? How did it go?